This standard addresses the development, design, installation, and management of alarm systems in the process industries. Alarm system management includes multiple work processes throughout the alarm system lifecycle. This standard defines the terminology and models to develop an alarm system, and it defines the work processes recommended to effectively maintain the alarm system throughout the lifecycle. This standard was written as an extension of existing ISA standards with due consideration of other guidance documents that have been developed throughout industry. Ineffective alarm systems have often been cited as contributing factors in the investigation reports following major process incidents. This standard is intended to provide a methodology that will result in the improved safety of the process industries. This standard is not the first effort to define terminology and practices for effective alarm systems. In 1955 ISA formed a survey committee titled Instrument Alarms and Interlocks. The committee evolved to Standard & Practices committee 18. In 1965 the committee completed ISA–RP18.1, Specifications and Guides for the Use of General Purpose Annunciators. In 1979 ISA released, as a product of the ISA18 and ISA67 committees, ISA–18.1–1979 (R2004), Annunciator Sequences and Specifications. In 1994 Amoco, Applied Training Resources, BP, Exxon, Gensym, Honeywell, Mobil, Novacor, Texaco, Shell, and others formed the Abnormal Situation Management Consortium (ASM) to develop a vision for better response to process incidents, with additional support in 1994 from the U.S. National Institute of Standards and Technology (NIST). In 1999 the Engineering Equipment and Materials Users’ Association (EEMUA) issued Publication 191, Alarm Systems: A Guide to Design, Management and Procurement, which was updated in 2007. In 2003 the User Association of Process Control Technology in Chemical and Pharmaceutical Industries (NAMUR) issued recommendation NA 102, Alarm Management. e) audit or assess alarm system performance. The alarm system serves to notify operators of abnormal process conditions or equipment malfunctions. 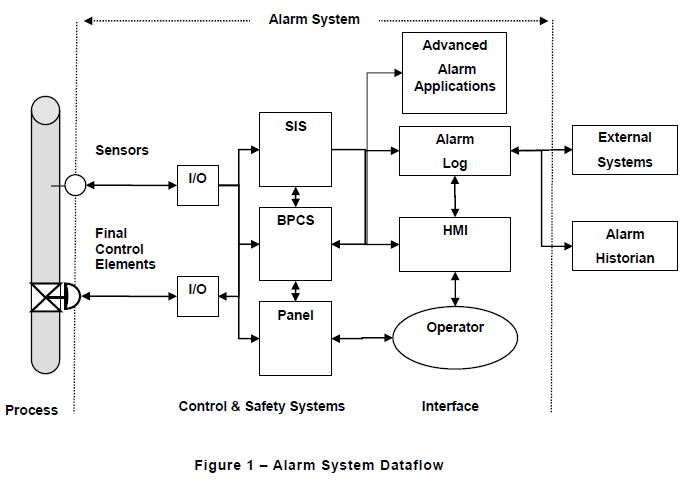 It may include both the basic process control system (BPCS) and the safety instrumented system (SIS), each of which uses measurements of process conditions and logic to generate alarms (see Figure 1). The alarm system also includes an alarm log and a mechanism for communicating the alarm information to the operator via a HMI, usually a computer screen or an annunciator panel. There are other functions outside the alarm system that are important to the effectiveness of the alarm system, which many include an alarm historian. Система тривог (Тривогова система) призначена для повідомлення операторів про ненормальні умови проходження процесу або несправності обладнання. Вона може містити в собі як основну систему управління (керування) процесом (BPCS - basic process control system) так і систему протиаварійного захитсу (ПАЗ, SIS - safety instrumented system), кожна з яких використовує контроль умов перебігу процесу і логіку для генерування тривог (рис. 1). Система тривог також містить в собі журнал тривог(alarm log) і механізм для передання інформації про тривогу для оператора через HMI (зазвичай, екран комп'ютера або панель сигналізації). Є й інші функції поза системою тривог, які важливі для ефективності системи тривог, які багато включають історика тривог (Alarm Historian). An enhanced alarming technique that can verify and restore alarm attributes in the control system to the values in the master alarm database. An alarm determined (i.e., by first-out logic) to be the first, in a multiple-alarm scenario. An alarm belonging to a class with more requirements than general alarms (e.g., a safety alarm). The transition stage between design and operation during which the alarm is put into service. An alarm generated by a field device to indicate a fault (e.g., sensor failure). An alarm used on a temporary basis (e.g., in place of an out-of-service alarm) without completing the management of change process. An alarm that indicates an operator action is required to complete a safety function (e.g., operator initiated instrumented function). The authorized list of rationalized alarms and associated attributes. A defined set of operational conditions for a process plant (e.g., shutdown, operating). The process of assigning a level of operational importance to an alarm. An alarm generated when the change in process variable per unit time, (dPV/dt), exceeds a defined limit. The process to review potential alarms using the principles of the alarm philosophy, to select alarms for design, and to document the rationale for each alarm. An alarm with limits that depend on the recipe that is currently being executed. An alarm from a remotely operated facility or a remote interface. The operator action that unlatches a latched alarm. The indication an alarm condition has transitioned to the normal state. An alarm that is automatically re-annunciated to the operator under certain conditions. An alarm that is classified as critical to process safety or the protection of human life. An alarm that indicates a demand on a safety function. A mechanism, typically initiated by the operator, to temporarily suppress an alarm. The operator action that terminates the audible alarm indication. An alarm that remains in the alarm state for an extended period of time (e.g., 24 hours). An alarm that is automatically modified or suppressed based on process state or conditions. A single human-machine interface within the operator console. An alarm generated based on statistical processing of a process variable or variables. Any mechanism to prevent the indication of the alarm to the operator when the base alarm condition is present (i.e., helving, suppressed by design, out-of-service). A mechanism implemented within the alarm system that prevents the transmission of the alarm indication to the operator based on plant state or other conditions. An alarm generated by the control system to indicate a fault within the system hardware, software or components (e.g., communication error). The unique identifier assigned to a process measurement, calculation, or device within the control system. A state in which the operator has not yet confirmed recognition of an alarm indication.